I love when a piece of furniture has a secret. Like when you open a cupboard and you have something that only you get to see. 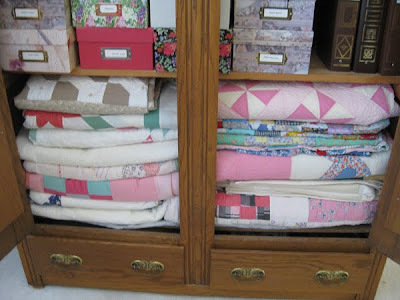 I have my quilt stash in this armoire.I love opening the doors and seeing the pretty stacks of quilty goodness. I think the reason I bought this primitive cabinet, was the red painted drawers. I never leave them open, and only I know they are painted red. I love that someone took the time to go the extra step to add some hidden cheerfullness. 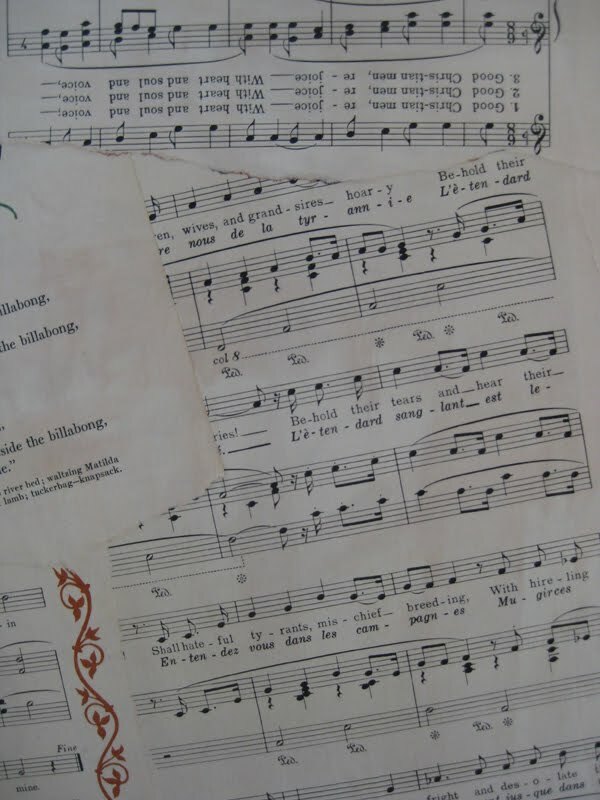 Most of you know I'm a piano teacher, and I love crafting with music paper. The back of this computer armoire was sitting against my stair railing. 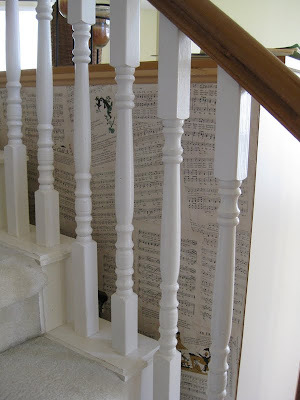 You can only see the decoupaged back, when you go up the stairs. Here it is peaking through. Someday I will add some hidden personality to a few more drawers and doors in my house. I've been so busy doing college scholarship paperwork, income tax stuff-YUCK! Just about done. Also taking care of my Dad, who is getting better. I'll probably take him back to Arkansas this week. Than hopefully I can catch up with all of your blogs and get back to some stuff here. Have a great week-end. What a delightful view as you go up the stairs. I like the RED in you're cabinet. That's make it just special! And you're musicpaper-idea is a super solution! Glad that you're dad is doing better. You did a good job. 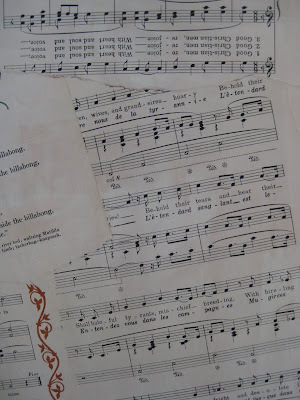 Wish you a nice weekend and all the best. Lovely greetings with heart &soul:Sil. 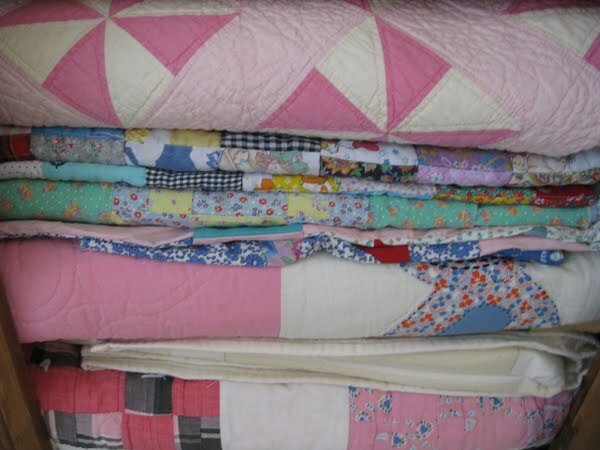 I love all the hidden treasures, and I would stare endlessly inside your beautiful quilt stash. I see pink!! :) I love your chair back too!!! I play piano and am trying to get started as a teacher too!! It is my passion. 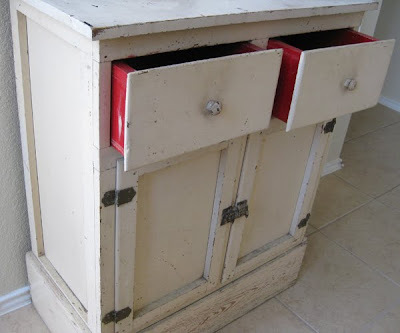 Love those red drawers too. Glad to hear your Dad is getting better and I wish him well!!! love the prim cabinet. And, I love decorating with sheet music. My oldest played the violin, the next one played the cello, and my son took piano for a few years too. Good luck w/ the college stuff. It can be so hard to navigate. Where is he/she going? Our oldest girl is @ The University of Chicago. And, the junior girl is in the process of looking. Whew! It wears me out! Love the stash of quilts AND the red drawers. It's the little things sometimes, isn't it? So glad to read that your dad is doing better, Leslie.